With any pump selection, the pump materials and process fluid compatibilities need to be considered. Specifically, whether the pump’s inner components (the impeller, casing, shaft and seals) can endure abrasive, corrosive or hazardous fluids. If these pumps are used in slurry applications, these issues will be magnified. This is due to the physical characteristics and hydraulic properties of slurries. Slurries carry solid particulates which increase the internal friction of the fluid. This can accelerate the wear on a pump’s impeller and inner casing, and cause other issues. 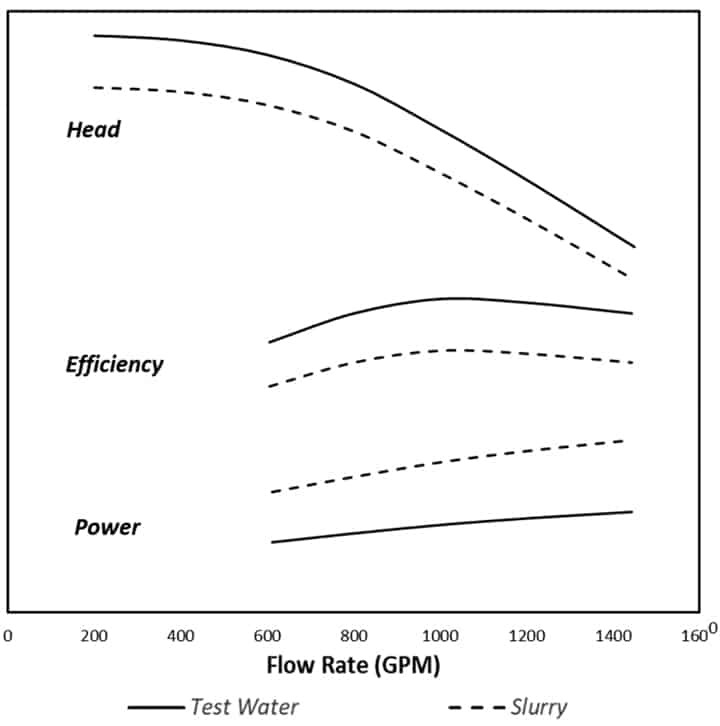 Since pump performance curves are typically generated using water as the testing medium, to properly size and select a slurry pump, the water-based performance needs to be derated. Figure 1. Slurry pump system. 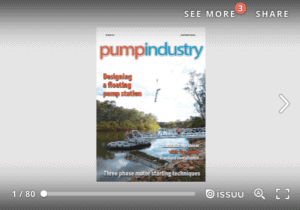 There are numerous methods that can be used to correct pump performance for slurries. This article covers the Hydraulic Institute (HI) Method and the Wilson Method (a modified Sellgren Method). Slurry correction methods will primarily require density and concentration data. For HI and Wilson, the methods also heavily utilise the particle size value to determine both the category of slurry and the correction factor (Hr) itself. This particle size, or d50 value, is the median size of a slurry. In other words, it is stating that 50 per cent of the particles within the slurry are of that size value or smaller. This can be determined using a sieve analysis using samples of the slurry. 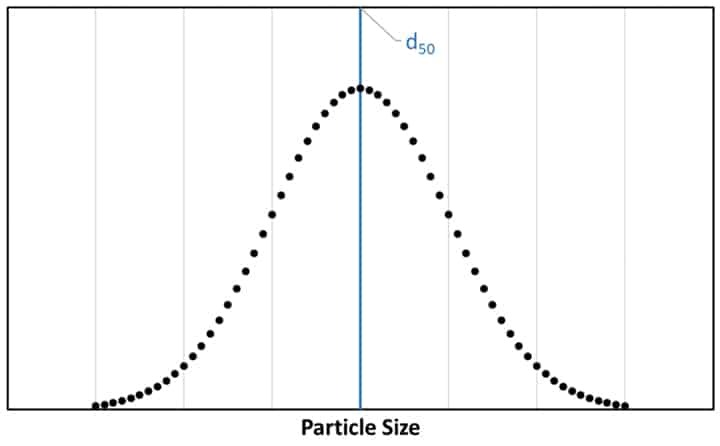 The particle distribution curve in Figure 2 shows an example of d50. Figure 2. 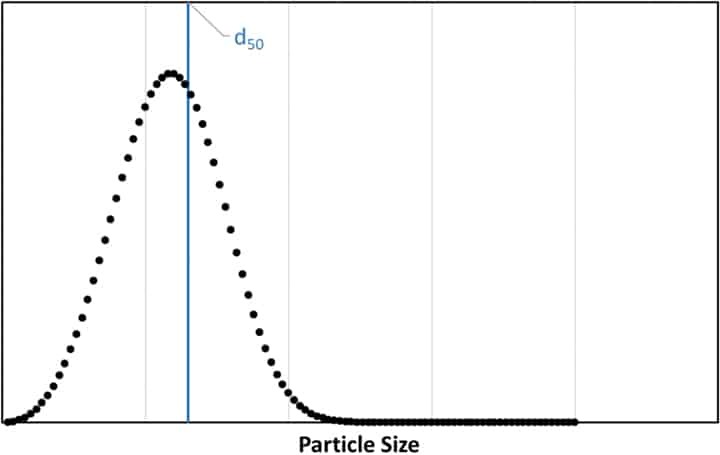 Particle distribution curve, vertical blue line indicates the d50. It is important to note that not all slurries will result in a symmetrical distribution. Figure 3 illustrates a median d50 which is not equal to the mode of the curve. At a high level, slurries can be classified into two categories: settling (heterogeneous) or non-settling (homogeneous). 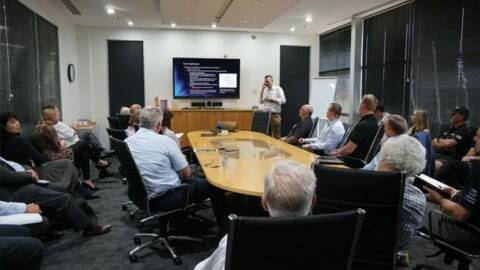 The slurry category will be the basis for determining which calculation method to implement: viscosity corrections (non-settling) or concentration corrections (settling). So how is a slurry determined to be settling or non-settling? Per the HI Method, the particle size (d50) and solids specific gravity (Ss) is used to determine the slurry flow regime. The Wilson Method differentiates the two regions solely on particle size. Non-settling slurries are considered to have a particle size, or d50, of 50 microns or smaller. Slurries with a d50 larger than 50 microns are categorised as settling. Figure 3. Asymmetrical particle distribution curve. At a high level, slurries can be classified into two categories: settling (heterogeneous) or non-settling (homogeneous). The slurry category will be the basis for determining which calculation method to implement: viscosity corrections (non-settling) or concentration corrections (settling). So how is a slurry determined to be settling or non-settling? Per the HI Method, the particle size (d50) and solids specific gravity (Ss) is used to determine the slurry flow regime. The Wilson Method differentiates the two regions solely on particle size. Non-settling slurries are considered to have a particle size, or d50, of 50 microns or smaller. Slurries with a d50 larger than 50 microns are categorised as settling. Starting with the same slurry properties, a water-based performance curve will be derated per both the HI and Wilson Methods. For a centrifugal pump operating at constant speed in this slurry application, it is expected that there will be an increase in power requirements over the water-based curve. It is also expected that the head and efficiency supplied by the pump should decrease, as shown in Figure 4. Hydraulically, this makes sense. Due to the additional internal friction, the pump will need to work harder to push the slurry through. Figure 4. 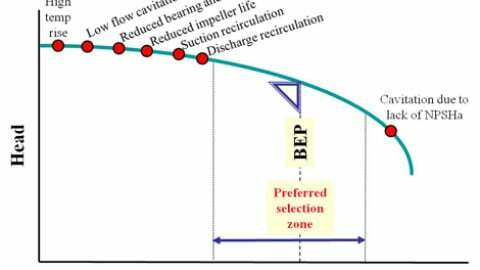 Expected pump performance shifts when handling slurries. Figure 5 demonstrates the pump derating with both the HI and Wilson Methods, respectively. Each method was used to determine the Hr correction factor. This factor was then used to correct each head and efficiency point. The HI Method calculated an Hr correction factor of 0.533, while the Wilson Method calculated the factor to be 0.835. For this chosen slurry, the HI Method resulted in more conservative corrected performance curves. Depending on the application and slurry, an engineer may either select one of the methods or use the methods’ Hr values to define a correction region and choose an Hr value between the bounds. This is illustrated in Figure 5 by the shaded areas. Figure 5. Pump head and efficiency curves, for a 12-inch impeller diameter, corrected for a slurry using the HI Method and Wilson Method. Efficiency curves are in green. There are multiple methods that can be implemented for slurry corrections, where some may be considered more conservative than others. It would ultimately be up to the engineer’s judgment to closely examine results and determine which method best fits the application, the pump type, as well as the slurry that will be handled. The methods outlined in this article are just two of the many being utilised in the pump industry. Often, pump manufacturers will develop their own slurry correction methods specific to their respective pumps. 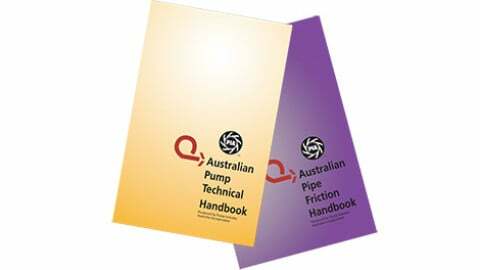 In all cases, the pump supplier should be consulted directly, especially when the application’s fluid is not water at the manufacturer’s test conditions. Ray T Hardee, PE, is the Chief Engineer and a principle founder of Engineered Software Inc., creators of PIPE-FLO® and PUMP-FLO® software. The PIPE-FLO product line helps some of the largest companies across a variety of industries find hidden profit in the design and operation of their fluid piping systems through simulation software, modeling services, and training opportunities. Hardee is a member of the Hydraulics Institute, ASME Energy Assessment for Pumping Systems standards committee and ISO Pumping System Energy Assessment committee. Ray’s publications include Piping System Fundamentals and contributions to HI’s Pump Life Cycle Cost and Optimizing Piping Systems. He can be reached at SimGuyRay@eng-software.com. Aasya (Sysy) Abdennour joined the Engineered Software, Inc. team in 2016 as the Technical Support Engineer assisting customers worldwide with setup, installation and support questions for PIPE-FLO® Professional. 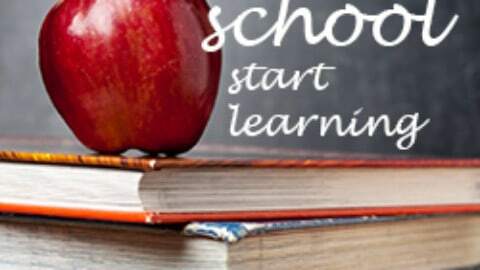 Soon afterwards, she became certified as Engineered Software’s Instructor for the two-day PIPE- FLO® FLO-Master course. She has over 100+ hours of instruction credits for the FLO-Master course and instructional product demonstrations. She is a major contributor to the PIPE-FLO® Professional Training instructional materials. Sysy is currently the lead engineer for modelling and engineering support for the PIPE- FLO® and Flow of Fluids programs. She has also serves as the Project Manager for integrating fire pump applications for Engineered Software, Inc’s. PUMP-FLO® product line.